Academy Award and NAACP Image award-winning actor Don Cheadle, who’s known for his roles in the films “Crash,” “Hotel Rwanda” and “Ocean’s Eleven, Twelve and Thirteen,” as well as “House of Lies,” is also an activist in the fight against climate change, visiting Africa as a goodwill ambassador for the United Nations Environment Program. He believes there are valid arguments on both sides of the debate over California’s Proposition 23, the ballot measure that would suspend the states landmark climate and energy law. He says it would create jobs in the clean energy economy, but would result in the loss of traditional energy jobs. But he believes the real point is that the transition to a green economy will, in fact, take place. And Americans need to decide whether they want to be leaders or play catch up — invest in sustainability, or take what he calls the short money by maintaining an economy based on fossil fuels. He says in his travels to Africa, he has seen what many believe to be evidence of climate change, including rising temperatures, effects on water tables, and deforestation. He says these problems are worse for people who live at or below poverty level. Cheadle says the best way for Americans to fight these problems is to support leaders who are committed to fighting climate change and working to mitigate its effects on those who are most affected. He says people can do this by voting, organizing and coming together around the issue. Do you want to hire Don Cheadle? Directly request a quote. In 48 hours we can send you the availability of Don Cheadle If you would like to book Don Cheadle, Entertainment Booking Agency is the right place. 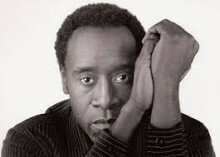 We will offer you the best price and contact the management or we directly contact Don Cheadle. For corporate appearances or speaking engagements you can contact our agents and the will help you true the process. Tags: hire Don Cheadle, Don Cheadle booking, book Don Cheadle, Don Cheadle appearances, find more information on booking Don Cheadle for appearances, Don Cheadle speaking engagements, Don Cheadle endorsements/spokesperson, Don Cheadle appearance fees, Don Cheadle booking agency contact info, biography of Don Cheadle, Contact an artist booking talent agent find a speakers bureau that can book Don Cheadle, speaker booking agency for Don Cheadle, Don Cheadle booking agency, Don Cheadle booking for corporate event. EBA is one of the biggest entertainment booking agencies in the World. We book hundreds of celebrities, artist, athletes and speakers in a year. Important to know is that we are not claiming to be the management of Don Cheadle. We are not the official agent for Don Cheadle. Companies from around the globe book these artists and speakers true our company be course we have one of the biggest networks and we always have direct contact with the artist or the management. We help you to find the right celebrities for your corporate of private events. Please contact one of our agents to get free advice and we will help to get the world-famous artist on your party.